Last month, Mattel released a Katniss Everdeen doll, inspired by the look and style of Jennifer Lawrence in the Hunger Games film. 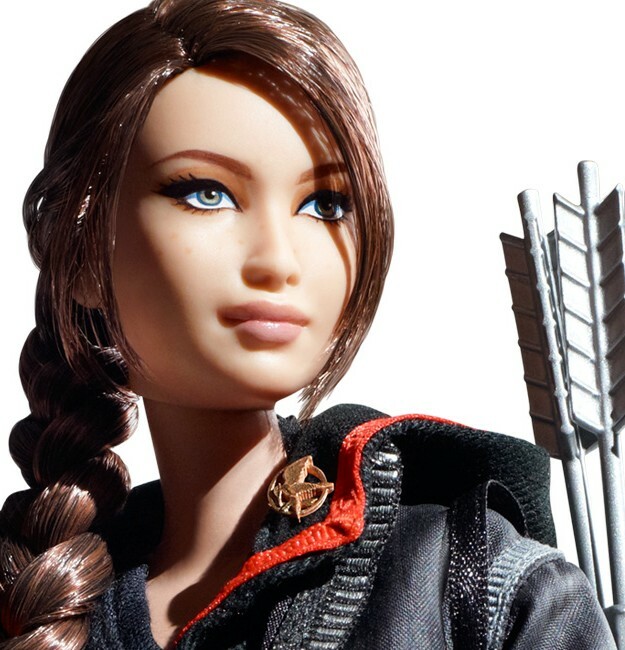 Compared with Mattel’s typical fare, the Katniss doll was refreshingly unsexualized–reflecting the character’s positive portrayal in the film (which I previously discussed here). 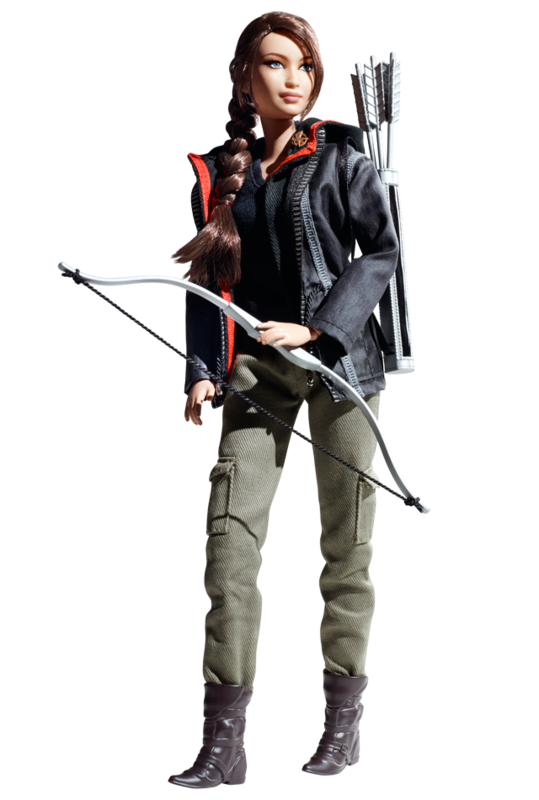 The Katniss doll is flat-footed (no Barbie-style feet molded for high heels), and she is dressed for battle (not in a gown or dress). Compared with the typical Barbie doll, Mattel’s Katniss wears very little makeup. Only her eyes seem made up, but the colors are neutral, suggesting this is actually meant as contouring to make the doll’s eyes appear more three-dimensional. 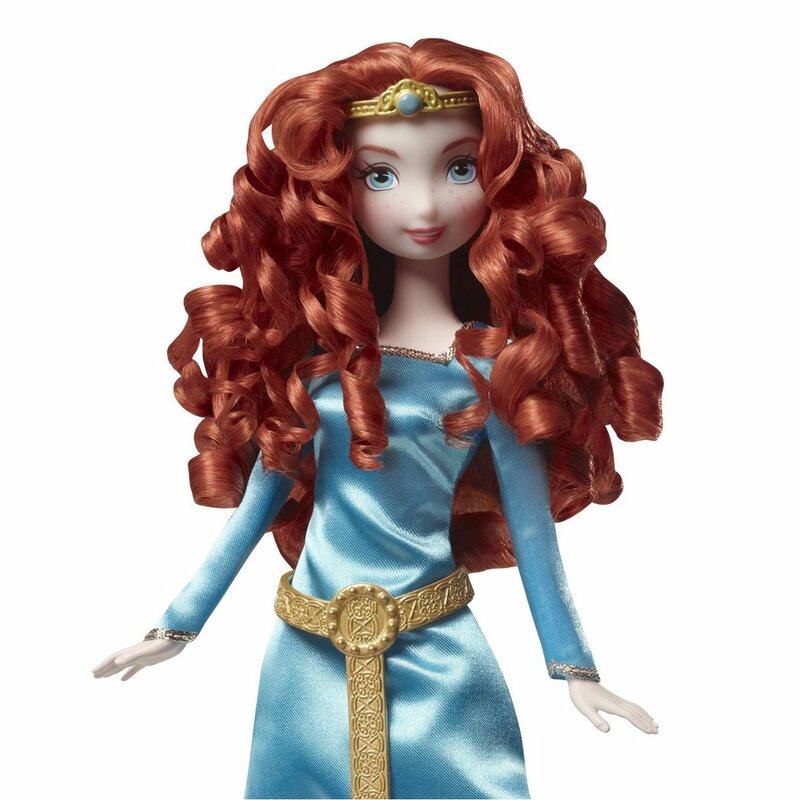 This month, Mattel released another doll based on a strong female character: Merida from Disney/Pixar’s Brave. Although the film will not be released for several weeks, the official trailers indicate that Merida is an atypical princess: like Katniss, she is strong-willed, independent, and a skilled archer. 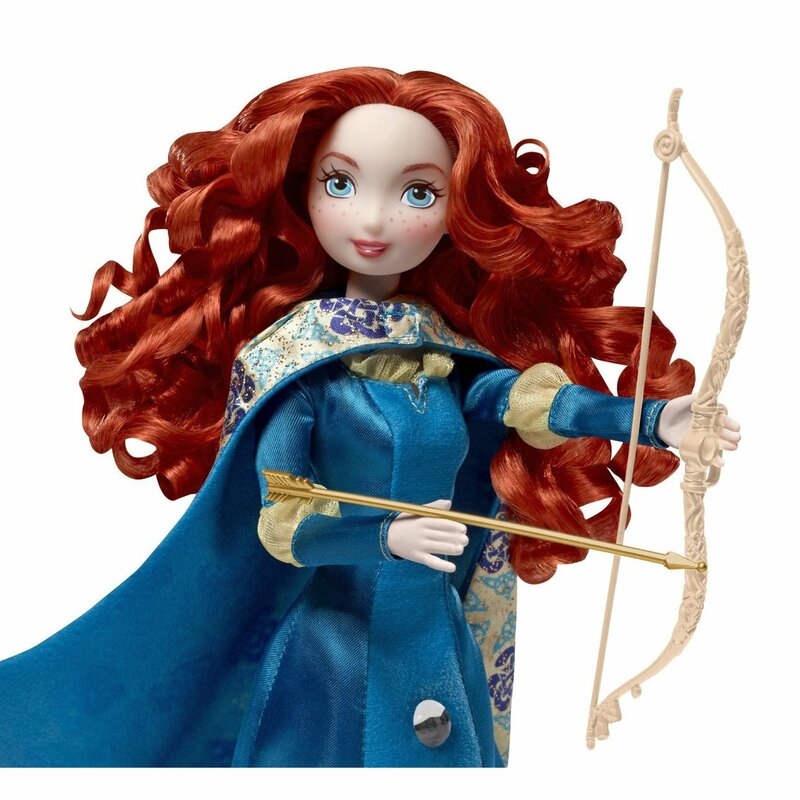 Unfortunately, unlike Mattel’s Katniss doll, Mattel’s versions of Merida leave much to be desired. Earlier this week, one mom who was shopping at Target was shocked by Mattel’s small doll treatment of Merida. The small doll is a 6.5″ tall, fully plastic doll priced at $5.99. The toy that comes out of the package looks nothing like the character on the package. 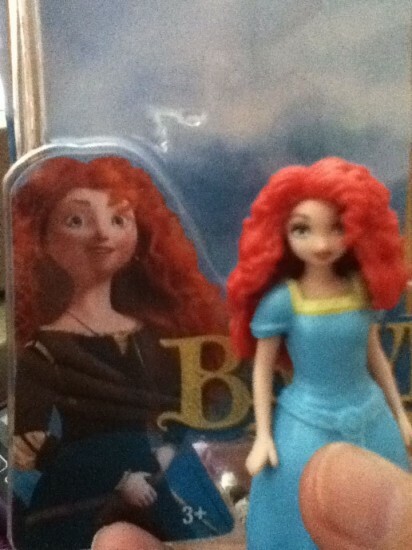 The toy looks like Merida’s hot older sister, who despite living in the Scottish Highlands during Medieval times, got her hands on some serious eye liner and lipstick. Note the incredibly long eyelashes, the impeccably groomed eyebrows, the rosebud lips, the gentle expression, and the dainty body language. 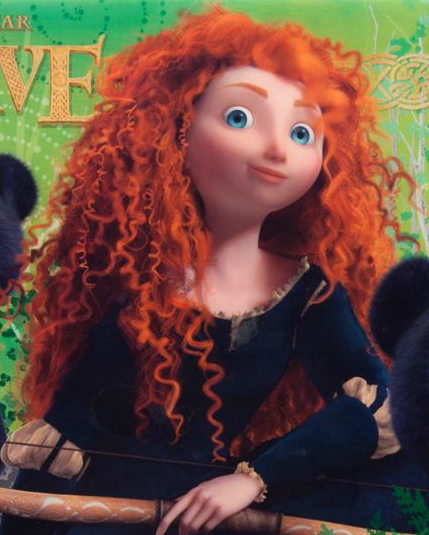 Note also that this is the dress Merida is depicted as hating in the movie, for she is obliged to wear a restrictive corset beneath it. Merida is lovely just the way she is. Mascara? Who needs it? Although Mattel designed a Katniss Everdeen doll that reflected the character’s strength and personality, when it came to Merida, Mattel didn’t even try. But why would that be? Both Katniss and Merida are strong, independent, and enjoy archery–yet their treatments by Mattel couldn’t be more different. The answer: just as the films target different audience members, these dolls target different markets, as well. Amazon says the recommended age for Mattel’s Katniss doll is 6 to 15. However, according to Barbiecollector.com, the Katniss doll is actually meant for adults. In point of fact, Katniss is from the Black Label line–all of which are described as being meant for adult collectors, ages 14 and up. Katniss’s design was led by one individual, Bill Greening, who describes himself as a Hunger Games fan and who approached the design with care. Fan response has been tremendous: the Katniss doll sold out almost immediately, and is now on backorder, with an expected availability four months from now. Unfortunately, because Mattel’s Brave line is intended for the preschool-to-grade-school set, Merida received no such treatment from Mattel. Presumably designed by committee, the Merida dolls rely on stereotypes about little girls’ interests. Make a little girl’s doll whose face isn’t redesigned to conform to Mattel’s beauty norms? Present a little girl’s doll as strong and independent, rather than dainty and sweet? Nah, that would be much too risky! Mattel clearly believes that long eyelashes and gemstone dress-up activities are a safer marketing bet. In my opinion, Mattel underestimates little girls. 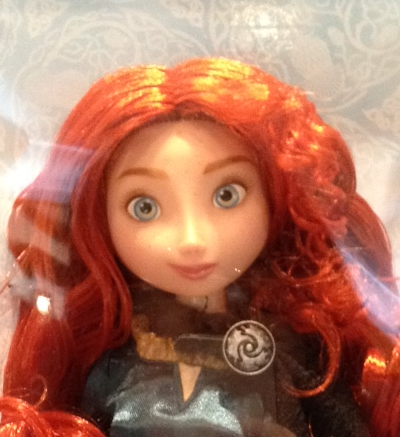 Give them a Merida doll that reflects the movie’s character, and they will love it. Mattel is also blind to why parents have responded positively to the Brave trailers: many appreciate that Merida is not a stereotypically princess-like princess. What a shame that Mattel couldn’t afford young girls who love Brave the same respect they afforded to the teens and adults who love The Hunger Games. ← Turn off your television! Screen-Free Week starts Monday. It is apparently impossible to make these dolls’ *hands* in a grasping shape (ubiquitous in boys’ action figures), even though their primary character trait is archery. I don’t know how that bow is staying in Katniss’ hands (magnet?). Men act and women appear. The doll marketed to girls is more feminized than the one marketed to late teens/young adults. “Mattel underestimates little girls.” While I completely agree with the author’s argument here, I still think the Katniss doll has way to much eye makeup. Yes, yes, and yes. And as for the makeup, boys’ action figures don’t need “contouring to make the doll’s eyes appear more three-dimensional.” Ugh. Yes, maybe I’m being too accepting of Mattel designer Bill Greening’s assertion that he gave Katniss a “makeup-free look.” Thanks for bringing it up. It will be interesting to see what the sales of Mattel’s Merida dolls do after the movie comes out. If the movie lives up to its hype and truly does feature a strong, non-sexualized woman without a love interest, then I wonder if the parents and children who love the film will be swayed by sparkly gems to decorate doll’s hair. If the sales are lackluster for the doll but good for the film, Mattel might get the message. I suspect a lot of doll purchases are made by friends and family members who may not be as familiar with the original texts as the children and their parents are. 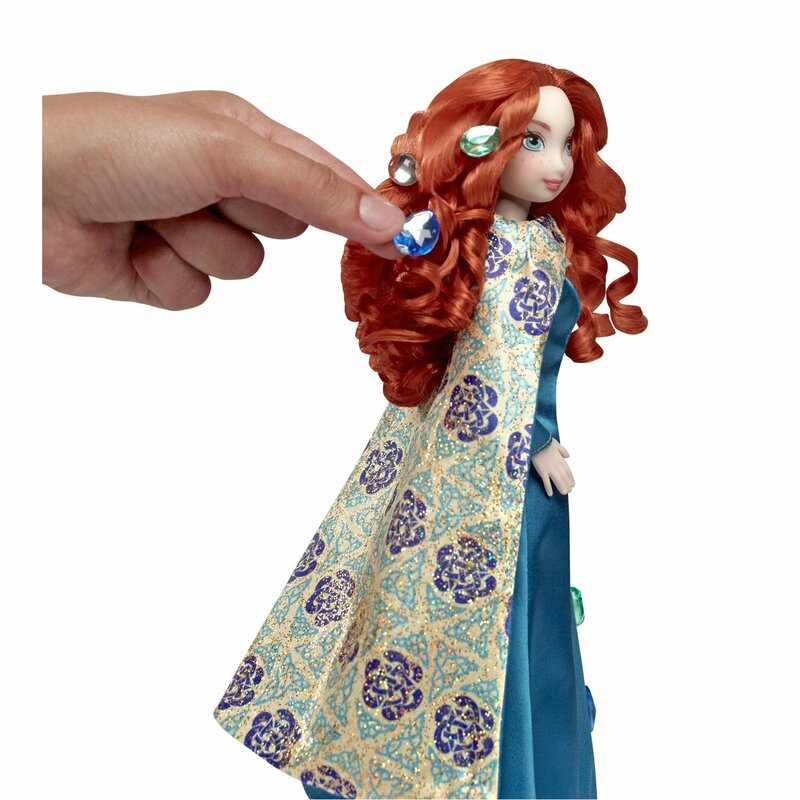 So it’s entirely possible that aunts and uncles and grandparents and family friends might say, “Oh, what a nice Brave doll this is!” and have no idea that Mattel’s version is so feminized and that Merida would NOT want sparkle gems in her hair. That’s probably true, and then the problem becomes how do consumers combat THAT. Already, most of my friends and relatives see me as a little unhinged when it comes to toys and girl culture, so I can already predict how well that conversation would go over . . .
Big difference among the dolls. You are right, it looks like Mattel didn’t even try. Thanks for doing a comparison. Uhh I LOVE both movie’s and I don’t really play with dolls but i like both and those both are my fave heroines ever! After looking in horror through the Mattel versions (the only reason I’d want any of those is extra outfits/accessories, and the one does have a cool reversible cape), I went with the Disney Store version. 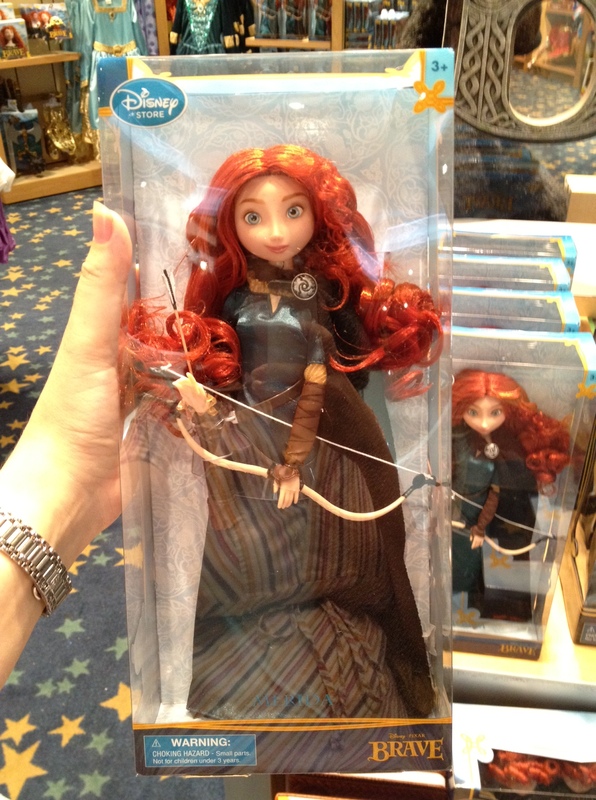 The face looks like the movie’s version of Merida, and the articulation on the arms and legs is nice. Very poseable. The only downside to it at all is you only get one arrow, and if you take the brown brace sleeve off, the dress sleeve doesn’t have yellow ruffles at the bottom. I’m guessing it’s cause you couldn’t get the brace/sleeve on otherwise. There is a Limited Edition doll of Merida with all the trimmings (sword, bow, arrows, belt, pouch, bear pendant, fancier dress and cape) but her face looks kinda pouty or concerned or something. It’s about $100 from Disney, or $150 on eBay. I agree. Now, when it comes to the dolls of her, if i get one, i’m getting the Disney Store one. How about you think outside the doll box. Did you ever stop to think that maybe, just maybe, Mattel is not allowed to make better quality Disney dolls!?! If you look back to the days before The Disney Store made it’s own dolls you can see that the Mattel/Disney dolls were well made. Disney wanted to cut the competition without ruining it’s relationship with such a well known company as Mattel. Therefore it still lets Mattel produce dolls with many limitations just to advertise itself. i think you’re right, though i have never watched the hunger games i have watched brave and Merida’s strength and fiery character should not be masked by perfect looks and pretty dresses which she is against in the film. Merida is supposed to be a free spirit who just wants to have fun and adventure. Mattel makes her look like some plastic glamour girl who is out to get all the boys, even though in the film she goes to great lengths to not get married. Mattel has put a sexist look on this doll and should be ashamed, i think the disney store one is much better and i will try to get my hands on one rather than this cheap mockery.